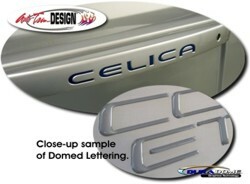 Detail your 2000-Current Toyota Celica with these "Polyurethane Domed" decals that fit in the depressed area of your Celica's rear hatch area as shown. "Domed" decals are not just vinyl decals. They are a tactile, three (3) dimensional decal that looks like a factory manufactured emblem. Available in a wide variety of colors. Easy to follow online application and care instructions are included.